Florida lawmakers backing expansion of the state’s Medicaid program plan to mount a new argument this legislative session: That voting against extending the program would deprive low-income U.S. citizens of access to insurance that’s available to some legal immigrants. Protesters gather in the Miami office of Florida State Rep. Manny Diaz as they protest his stance against the expansion of health coverage in Sept. 2013. A new bill to expand Medicaid coverage in Florida argues that not doing it would deprive some U.S. citizens health coverage while legal immigrants get help to afford it (Photo by Joe Raedle/Getty Images). At issue is a little-noticed provision of the federal health law that allows some low-income immigrants who are living here legally to qualify for subsidies to help them buy private insurance through online marketplaces. Poor U.S. citizens aren’t eligible for those subsidies because the law provided for an expansion of Medicaid to help them get coverage. But a U.S. Supreme court ruling made this provision voluntary, and Florida was among two dozen states that opted out, leaving an estimated 760,000 state residents ineligible for either subsidies or Medicaid. “It doesn’t matter where you are on the immigration issue … It’s a fairness issue,” said Republican state Sen. Rene Garcia of Hialeah, who has introduced a bill in the session that begins March 4 to accept billions in federal dollars to extend coverage to hundreds of thousands of Floridians. But in a state with a large foreign-born population, the immigration issue injects a political wild card into a debate that has largely revolved around ideological differences. Critics of the health law argue the federal government can’t be counted on to continue paying for expanded benefits. Proponents say it would be foolish to walk away from billions of federal dollars that would extend coverage to hundreds of thousands of poor Floridians and reduce uncompensated care costs for health care providers. In Arizona, concerns about the political fallout of the immigration issue were said to have helped persuade Republican Gov. Jan Brewer, an ardent foe of the health law, to expand Medicaid eligibility last year. Brewer’s budget advisers said that without expanding the program, “only legal immigrants, but not citizens [below the federal poverty line] would be eligible for subsidies,” according to documents obtained by the Associated Press. But in Florida, proponents see an uphill battle. Last year, the Republican-controlled state Senate and Gov. Rick Scott, a Republican, blessed a similar expansion bill, but the House, also controlled by Republicans, refused to go along. “I don’t think [this] will change the landscape,” said Thomas W. Arnold, the state’s former Medicaid director, who is now a lobbyist for the health care industry. To be clear, the health law provision does not apply to immigrants in the country illegally, who are barred from Medicaid, subsidies or even from purchasing private coverage at full cost through new online marketplaces. But the law’s framers sought an option for legal immigrants, many of whom are barred from enrolling in Medicaid for five years. If those immigrants are in the five-year waiting period and earn less than the federal poverty level — $11,400 for an individual or $19,530 for a family of three – they can qualify for a subsidy to help them buy private insurance. To get this help, they cannot be offered affordable health insurance through their jobs. In addition, those earning between 100 percent and 400 percent of the poverty level – up to about $46,000 for an individual or $78,120 for a family of three – are eligible for the same subsidies as U.S. citizens. The provision for poor, legal immigrants has received little publicity to date, in part because even advocates of Medicaid expansion prefer to talk about its financial and health benefits, rather than raise an issue that might spark backlash against immigrants. Opponents of expansion, too, could find the discussion politically difficult. Currently, Florida does not offer Medicaid to adults without dependent children, no matter how low their income. For parents, the income cutoff is 38 percent of the federal poverty level, or $7,421 for a family of three. Children in families earning more would qualify under more generous rules for kids. But in participating states, the health law expands the program to cover everyone up to 138 percent of the federal poverty level, about $15,900 for an individual, including adults without children. The federal government pays 100 percent of the cost of newly eligible enrollees for the first three years, and scales back over time to 90 percent. Expanding the program could bring Florida about $66 billion in federal dollars over the next decade, according to a 2013 report from the Urban Institute. It would cost the state about $5 billion over that same period. Garcia’s legislation, which has a House companion sponsored by state Rep. Amanda Hickman Murphy, a Democrat, calls for using federal dollars to buy private insurance policies for those newly eligible for Medicaid. 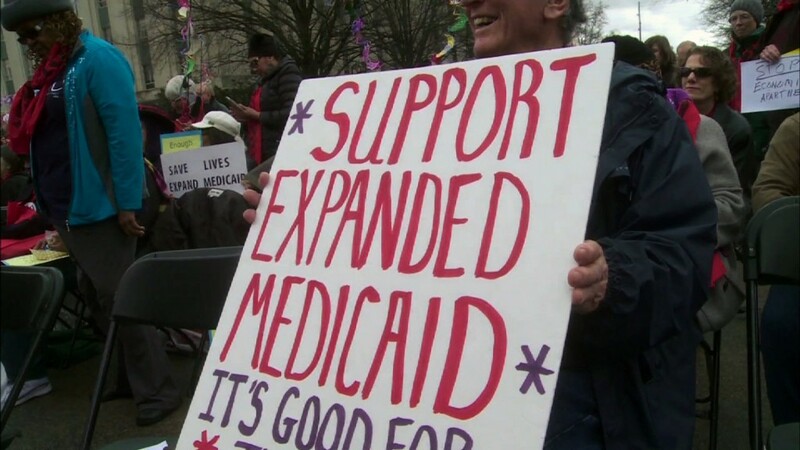 Under the proposal, the state would use federal dollars to allow Medicaid enrollees to buy private insurance policies. Arkansas and Iowa have adopted similar programs and several other states have shown interest. But despite support from Scott and the state Senate last year, Florida House members preferred a much smaller expansion that would have used state dollars only. Republican House Speaker Will Weatherford’s opposition to Garcia and Murphy’s bill remains unchanged, spokesman Ryan Duffy said in an email. He did not respond to questions about the differing access to subsidies for U.S. citizens versus legal immigrants. Garcia said he plans to publicize how rejecting the expansion creates a disparity between some citizens and legal immigrants. “Very few are aware of that component of the law,” he said. “When they realize it is there, it may change some mindsets,” he said. Despite their inclusion in the health law, getting insurance is proving difficult even for legal immigrants who qualify for a subsidy. For one thing, they still must pay about 2 percent of their household income toward the premium, which could be a stretch for some families. “I don’t go to the doctor regularly, why am I going to pay for a service I don’t use?” asked Fila Granados, an immigrant in this country legally who works at Plants in Design nursery in Homestead. And simply finding out about the option may be difficult since few insurance brokers and counselors are familiar with the provision. At a recent enrollment event in Florida City, a community with many Haitian and Hispanic immigrants, many of the trained counselors were unaware that some immigrants could qualify for subsidies. “I didn’t know about the rule,” said Kristia Stewart, a case manager of Community Health of South Florida (CHI), who is in charge of outreach and enrollment. Greg Jenkins, a navigator with the Epilepsy Foundation of Florida, which assists people with health plan enrollments in 35 Florida counties, also knew nothing about it. Technical issues with healthcare.gov have also hampered efforts. “If you are in a non-expansion state, it will say you are not eligible for Medicaid or the subsidies,” said Shelby Gonzales, senior policy analyst at the Center for Budget and Policy Priorities. She and others said the Department of Health and Human Services is working to resolve the problem. In the meantime, advocates suggest that legal immigrants in the waiting period consider filing an appeal if they are below poverty and have been rejected for subsidies.